TeDIS - Studies on Technologies in Distributed Intelligence Systems - carries out applied research activities on innovation and competitiveness of SMEs in the global economy. Applications open to teach one or more courses during a semester of the Globalization Program at Venice International University: tenured professors at one of the member universities or experienced scholars in employment at the CNR willing to teach in the period Fall 2017-Fall 2018 can find information at this link. Deadline: April 16. 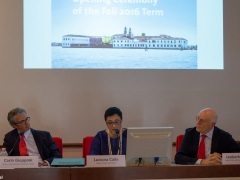 The first edition of the Venice Universities' Model European Union (VeUMEU) will be held at VIU on 5-7 May 2017, on San Servolo Island. Through the simulation of the EU legislative procedure and acting like real MEPs or Council delegates, student participants from VIU member universities will gain an understanding of multilateral diplomacy and test their negotiating and leadership skills. VIU is now on Instagram: breathtaking images from San Servolo island, our daily life and activities in and outside Venice. Discover more in our Instagram page “@univiu” and share your pictures with our hashtags, we may repost the most interesting or funniest ones. Find us also on Facebook, Twitter, Flickr and Youtube.